Can you say YUMMY ?!! I couldn't resist photographing these fabulous yarns...so beautiful just laying in a pile. I love the combination of colors and strong lines. Does it inspire you? Do you see that same fiery sunset draped across a lush landscape? You might ask what I do with them...especially since I don't crochet or knit. 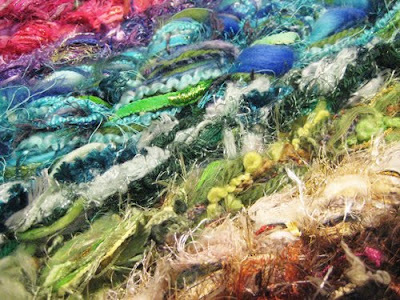 :) But there are so many other possibilities for interesting fibers...so many ways to use them. 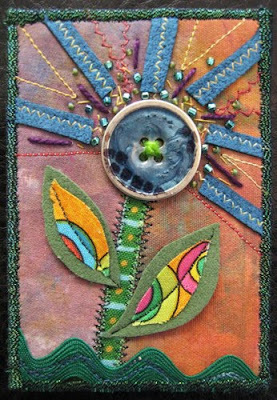 They make wonderful embellishments for embroidery and can be couched down in the design or worked around the edge to give the piece a finished look. 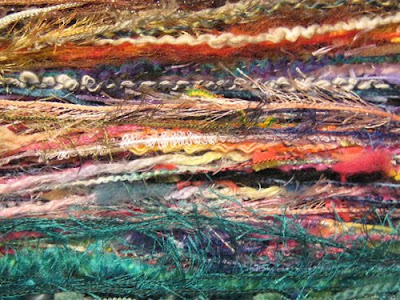 Needlefelting bits of them into a piece of wool provides added texture and interest. So many possibilities!